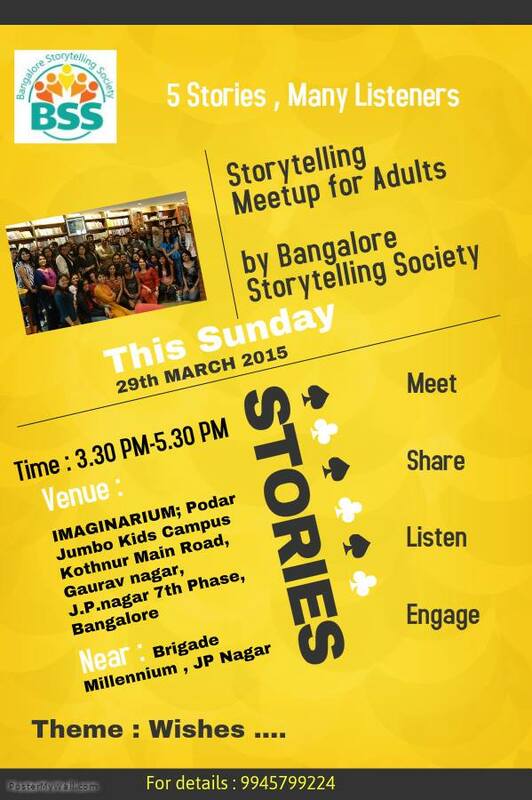 Bangalore Storytelling Society meet-ups are always special and recent meet-up was no different. Theme of this month meet-up coincided with World Storytelling Day theme, ‘Wishes’. We all have wishes, dreams and aspiration to get something, to become something or simply to lay down our life on certain path. This meetup brought some of our wishes back in our life. At the starting of the event, event host Vikram Sridhar asked each person to introduce himself/herself along with sharing one of their oldest wishes. It was interesting to share my wishes with people and also listening their wishes. After the initial round, we all were settled for listening for the story of the people. Narrated by Anish Tom Abraham, It’s about Vietnamese talk of the lost eyes and then recovering them back. This story talked about wish of a girl who was blind. Narrated by Kriti M Sarkar, the second story was about an autowallah, his romance with lady sitting behind his back and his courage to save a man. Narrated by Adithya Nair Satheesan. It was the story from Jeffrey Archer on how one CEO person get to see lot of things. How he tried to win over death and arrange his retirement only to find out, he could not see what he wanted. It was my story, telling more about the wish of a person in finding perfect life partner. It included confusion, misguidance from friends and families as well as prayers at the Google god. In between each of the stories, we had various discussions about wishes of great leaders and how they were inspired by small incidents and events. The informal discussion brought many new stories of lost art, teenage girl who inspired father of our nation as well as upcoming event in August. Bangalore Storytelling Society (BSS), a not-for-profit collective, formed by professional storytellers in 2013, is dedicated to reviving, nurturing and promoting the art of oral storytelling. It organizes theme-based story events, and create opportunities for story lovers–of all ages–to tell and listen to tales and re-discover some of what we’ve lost in this wonderful, but somewhat isolating, technological age. This Flag ship event has already seen two seasons and now their 3rd edition at Atta Galatta promises to be a knock out too. ← Democratic ways of decision making- my first taste of democracy!